Heartbreak Again As 520 More Genocide Victims Are Buried In Srebrenica : The Two-Way In a sad annual ritual, the latest victims to be identified from among the more than 8,000 who were massacred there in 1995 were interred today. 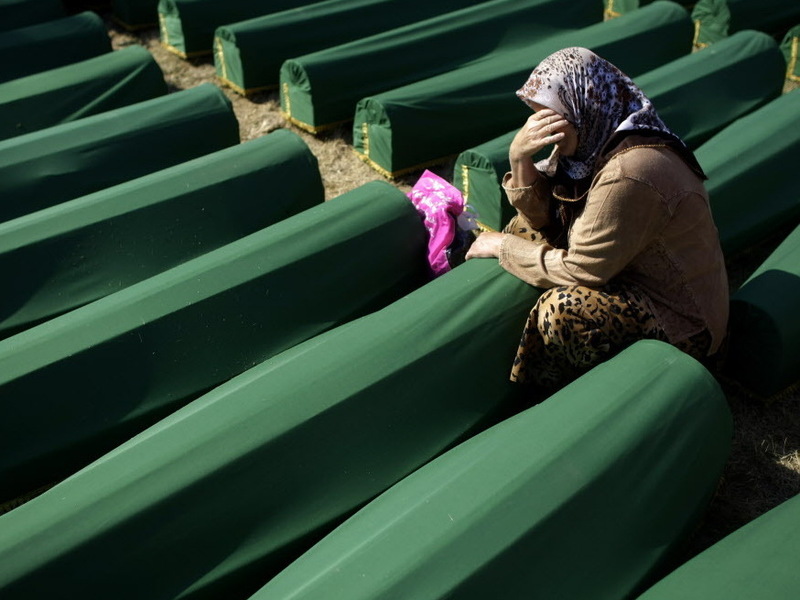 Earlier today, a woman cried next to the coffin of her relative at the Potocari memorial complex near Srebrenica. On this "17th anniversary of Europe's worst massacre since World War II," 30,000 people gathered in Srebrenica, Bosnia-Herzegovina, today to bury 520 more victims of the 1995 slaughter there. And as The Associated Press says, "the annual ritual was as heartbreaking as ever." "Another woman dropped on her knees next to a coffin, pressing her lips against the green cloth covering its wood. 'It's your sister kissing you. It's me,' she whispered to the coffin, caressing it with both hands until others lowered it. "Then the valley echoed with the sound of dirt landing over 500 coffins from thousands of shovels as a voice read out the names of the victims and their ages from loudspeakers." Names of the 520 victims buried today are posted here, at the memorial center's website. As the AP reminds us, "Srebrenica was a U.N.-protected Muslim town in Bosnia besieged by Serb forces throughout Bosnia's 1992-95 war. Serb troops led by Gen. Ratko Mladic overran the enclave in July 1995, separated men from women and executed 8,372 men and boys within days." Bodies are still being found in mass graves, AP adds, and the grim task of identifying them continues. "So far 5,325 Srebrenica massacre victims ... have been laid to rest." The pictures from today's service, one of which we're including here, tell the sad story of the ceremony well. Back in 2005, All Things Considered reported on the 10th anniversary ceremony.